A few months ago we made plans to come to Virginia for Thanksgiving weekend. It had been almost two years since I last saw Rabbi Levi, as I was moving to Florida to get married. I wanted to introduce my now one year old son to the man who made the biggest impact on my life. When I first met Levi about five years ago, my intention wasn't to convert. I was searching for information about the Seven Noachide laws, and one of the sites I read mentioned Chabad. The closest one happened to be the one in Tysons. I emailed Rabbi and explained to him what I was interested in learning. Later he came by my work and chatted with me a little. At the time there was a learning session at the Chabad, and I would come to learn with Rabbi Levi. 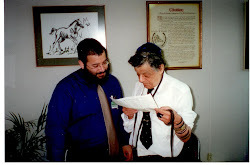 Through out my time with Chabad in Tysons, Rabbi Levi would give advice and coach me as I became more Jewish. I remember him by my side as I sat with the Beit Din giving me support. Looking back, there are things I wish I could have done better. I wish I called more often. I wish I visited more often. I have missed so much since I left, and now all I have are memories.